The Cleveland Indians made what appears to be a nice value addition today in trading Brandon Moss,who has been less than a strong acquisition since being brought in from Oakland for highly thought of pitcher Rob Kaminsky from the Cardinals. Moss leaves Lake Erie hitting just .217 albeit with 15 homers,but was arbitration eligible at season's end and judging by the performance that I saw,I'd guess that the Indians would more likely than not have been willing to allow Moss to walk away from an already expensive paycheck. The Cardinals usually aren't the type to hit the panic button in a trade like this,but the recent injury to Matt Holliday may have put them in a situation that they felt forced to make a move while they still could. 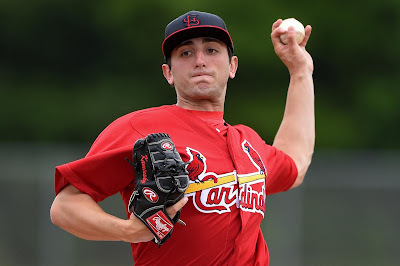 Much more excited about Rob Kaminsky,who was ranked as the Cardinals fifth rated prospect by Baseball America entering the season and likely was moving up the charts after a season at High A Palm Beach. Kaminsky notched a tiny 2.09 ERA in 17 Florida State League starts and is reported to have "Plus Plus" curve with a low 90's fastball that can touch the mid 90's. The 5'11 Kaminsky will likely be assigned to High A Lynchburg,although the team could decide to challenge him a bit after his FSL performance and try AA Akron. Kaminsky was the Cardinals first round pick in 2013 (Turns 21 after the season) and frankly seems to be above the return that I would have expected for a Brandon Moss after the season that Moss has put together. I'm often critical of the Indians and their thinking and I was pretty disappointed with the Eric Stamets for David Murphy,but this is more than I would have expected for Brandon Moss,so I suppose it's a wash.
Hope to be back later with a look on the Devils continuing to get younger and faster with the contract extension to Adam Larsson and buyout of the contract of Dainius Zubrus and maybe some thoughts on our trip to Binghamton New York! Cleveland trades! Cavaliers and Indians! On the morning that my vacation truly begins (as in I get to start doing things! ),I wanted to get a quick post in. Two trades from Northeast Ohio as both the Cavaliers and Indians have made a move.. The Cavaliers decided to pass on the available player options with their soon to expire Brendan Haywood exception and chose to bank the dollars for future use. Cleveland sent Haywood and in a mild surprise Mike Miller,along with two second round draft picks to the Portland Trail Blazers. In return,the Cavaliers add two trade exceptions of 10.5 million and 2.94 million respectively. The exceptions cannot be used together,but this increases the chances of the team being able to make a trade in season and that is a huge help for a team straining against the roof of the cap. Neither Haywood or Miller were a help last season,but Miller picked up his player option and between that and his well-known friendship with LeBron James,Miller looked to be safely on the team. The Indians are a disappointing team to many (I thought their lineup wasn't as strong as thought,though I liked the arms) and when you disappoint,you become sellers not buyers. The problem is that Cleveland has little to trade without disrupting a core that is needed to compete next year. The result is trading spare parts and David Murphy was the first to go as the Tribe sent Murphy to thr Angels for a less than overwhelming result in AA shortstop Eric Stamets. Stamets hit just .248 in his second year at AA Arkansas and reported to be an excellent glove with struggles at the plate. The numbers bear that out and one would think that the upside for Stamets,a Dublin,Ohio native,is as a glove first utility infielder. In other words,nothing to get excited about. Our interview with Jessica Rosales of Fox Sports One continues with today's part two! TRS:You also spend time on TVG (a Horse Racing Network),did you have any background in horse racing? JR:Absolutely not! Luckily I had some great mentors at TVG that took me under their wings and helped out beyond anything I could have ever asked for. Everyone there was great and did their best to make sure I was comfortable and it was fun learning a new sport at that level. I got to do a lot of really fun things, I covered the Belmont Stakes in NY and attended opening day at Del Mar and even though I no longer cover the sport for TVG I’ve really learned to love it. My mom and I still make wagers on our TVG app at home and watch the races when we can! I also think getting to see American Pharaoh win the triple crown this year meant more to me even though I wasn’t working because I had that background and understanding of the sport and just what it meant. TRS: I've always thought that boxing and horse racing are often two sports that networks seem to believe that almost anyone can do and as a result has had many ill-prepared broadcasters. Would you agree and if so,what can be done about it? JR: I believe as a reporter, the best way to be prepared is always do your research. You are considered the “expert” on what it is you’re talking about, whether it is boxing, horse racing or any other topic you can think of. It all comes down to preparation…and when the moment comes, the fans and those watching will know whether you’re faking it or not and thats when I'll preparation catches up to you. So just always be prepared and know your stuff. No matter what the topic is! TRS: You also have done some work in entertainment,such as the American Music Awards. Do you see yourself in the future as an entertainment reporter or a sports reporter,if you would be forced to make a choice? JR: I would be really torn if someone said I had to pick just one. They are two very different experiences, for me, and what I’ve been given the opportunity to do. But I do hope that one day in the future I can do some entertainment stuff again. but right now, I am very happy covering sports and continuing on the path I’m on and you never know what can happen in the future! TRS: Were there any special high points as an entertainment reporter? JR: Yes! SO many! Top moments I'd have to say were getting an exclusive live interview with Martin Scorsese and making him laugh like we were best of buds, interviewing one of my idols, Tim Burton (had I not become a reporter i would have worked in animation) getting to spend a week in London covering the Fast and Furious 6 movie and top number one can not beat moment that I will talk about from now until forever and ever…i hosted the Red Carpet for The Lone Ranger for Disney and TWC And got a kiss from Johnny Depp. i have a photo from the moment it happened and it is framed in my home office because to this day I still can’t believe that happened! TRS: Hypothetically-If there was an assignment in the entertainment industry,a big horse race and a big boxing match and all was equal-what assignment would you take and why? JR: Ha! well I guess it depends on the details…can’t I do all 3?! If the entertainment thing was a morning thing I could run and do that, make it for the big race…and then cover the main event in boxing! Ha! Wishful thinking! Guess I’ll know which I would pick if it actually happened. I didn't have time to post my picks in the boxing challenge yesterday,but the dullest fight enabled me to take a two point lead in the boxing challenge over R.L Malpica. We each earned two points for Sergey "the Krusher" Kovalev's three round destruction over top rated (by the IBF anyway) Najib Mohammedi to retain his WBA and IBF Light Heavyweight titles. 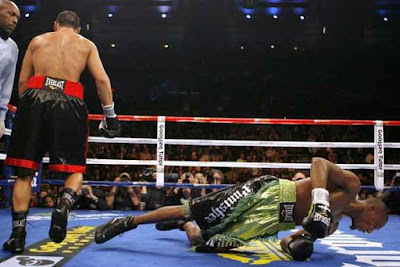 Kovalev sent Mohammedi to the floor in round two and finished him in round three. I picked Kovalev to win in two rounds,Ramon liked him in four,so by winning in three,Kovalev split the difference. Kovalev will fight in his native Russia in November against an unnamed opponent. Reportedly,the fight will offered to former Russian Olympian ( and Kovalev amateur conqueror) Artur Beterbiev in what might be the toughest test for the Krusher,although promotional issues might make it a difficult bout to be made. However,there is a chance despite those problems because being in Russia,both fighters could make a career high purse and solidify the winner's brand in their home country. I'm a huge Kovalev fan,but something nags at me about him. I have this funny feeling that he has a little Sonny Liston or Mike Tyson in him that when someone stands up to him,that he might have major problems. Hope I'm wrong because he is a fun fighter to watch and I'd love to see a potential battle of wrecking balls against Beterbiev. The undercard featured Jean Pascal,who lost to Kovalev last out in a good fight in a bout against unbeaten Cuban Yuneski Gonzalez in what was another exciting bout. Problem was they picked the wrong winner as Pascal won a unanimous decision that earned R.L and I each two points,but was disappointing in the facts. I had Gonzalez winning 97-93 and if there is any justice (boxing justice! HA! ),Gonzalez would get the next shot vs Kovalev,if Beterbiev cannot be available as the next opponent. On what could best be called a throwaway PBC card and worst a garbage card on NBC Sports Network,former WBA Lt.Heavyweight champ Beibut Shumenov won a unanimous decision over cruiserweight (and sometimes PBC commentator) B.J. Flores in a forgettable bout. I agreed with all three judges that scored Shumenov a 116-112 winner. I earned two points for a Shumenov unanimous win,while Ramon picked Flores and that made the difference in the boxing challenge as I currently hold a 96-94 lead. Vacation has started so I'm not sure how much time I'll have for here. I'll try to make time to keep things (and you) updated and I think I'll have the second part of our Jessica Rosales interview up tomorrow!!! The three way race for the Ohio State quarterback position was trimmed to two when Braxton Miller announced that he was going to play H-Back,Wide receiver along with returning some kicks for the 2015 season. Miller said his torn labrum ( a muscle in his shoulder)had not returned to 100 percent and couldn't compete at a top level as a passer. Whether or not that is true or not,I wouldn't know,but it does create a convenient excuse for Miller not to add to a clear quarterback controversy. The decision also gives Urban Meyer so many more choices offensively as Miller adds to the playmakers and weapons,along with giving the Buckeyes options with Miller throwing the ball that must give opposing defensive coordinators nightmares. Miller also adds to his NFL value by being able to prove that he can catch the football as his physical size and skills makes him a very viable wideout at the next level. In addition with Miller playing multiple positions,Ohio State has a potential weapon that is second to few with the football in his hands. Miller as a return man is interesting because of the presence of Jalen Marshall,but in certain scenarios,Ohio State could put both players back and refuse to allow teams to kick away from the gamebreaking potential in both players. 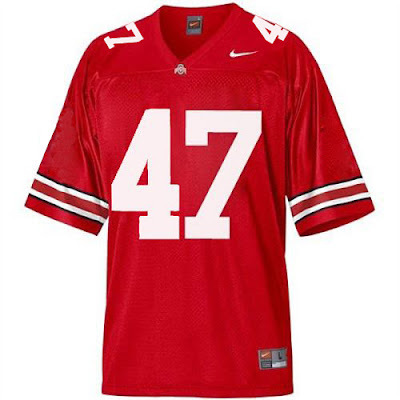 What Braxton Miller may have done most is take care of his future after football with this decision. 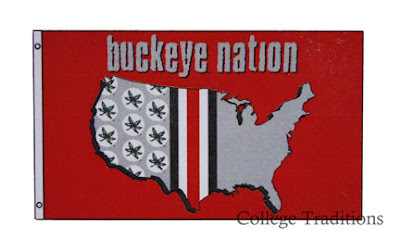 Braxton Miller is an Ohio native-He's from here,he lives here and he'll likely return here after any NFL career and in a state with a massive amount of alumni in business,Miller's decision to put the OSU program first on two different occasions (coming back for 2014 and this team first decision) will keep him as a beloved figure in Ohio State football history. Miller will be remembered for such and he'll have no problems finding jobs,endorsements,speaking engagements etc for the rest of his post OSU days. Now the battle is down to J.T,Barrett vs Cardale Jones and each have compelling arguments. Barrett set many records and put the Buckeyes in a position to have a chance to reach the postseason. Barrett also would be a multi-year quarterback and would allow the stability at the position to allow incoming players to develop slowly. Jones won the three biggest games for the Buckeyes in the last 10 years,brought a national title to the program and might deserve a chance to be the man in his final year in Columbus. I don't think that Urban Meyer can go wrong with either guy,but the main issue will be this-Can the Buckeyes avoid a divided locker room and they afford a quick hook or a quarterback shuffle? The Cleveland Cavaliers looked to improve their bench with needed shooting and preferably with a veteran background. Cleveland did both with the addition of well traveled Richard Jefferson to the veteran minimum contract for a one year. 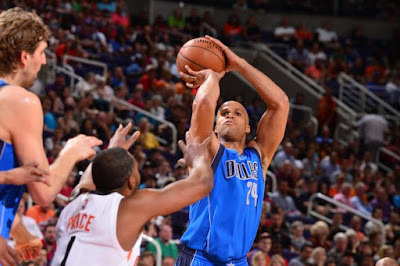 Jefferson isn't the slashing player that he was in his prime,but what the 35 year old has done is change his game to become a knockdown three point shooter. 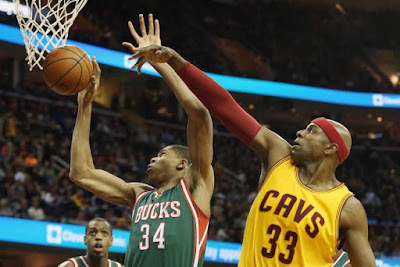 I discussed this in yesterday's podcast and what I see Jefferson becoming in the Cleveland offense is exactly what the team hoped that they would be able to bring with the long hype which was unrewarded for Ray Allen-A three point shooter that can bolster the second team in offense and when he plays with the number one unit,Jefferson can command the respect of defenders and not allow them to play inside the paint exclusively. Jefferson shot 42 percent last season from three point range and is a 38 percent shooter for his career. Jones shouldn't be counted on every night,but could be an occasional help on the odd night. Cleveland also traded their top draft pick in second rounder Raheem Christmas to the Indiana Pacers for a 2019 second round pick. I wrote when the Cavaliers drafted Christmas that he could have helped as a rebounder/shot blocker,but would need development time at best and might have struggled to see time off the bench. Christmas could be much better off in finding court time as a Pacer with Indiana losing big men David West and Roy Hibbert as Indiana continues to rebuild. I hope to be back with a few Braxton Miller thoughts and part two of our interview with Jessica Rosales soon! 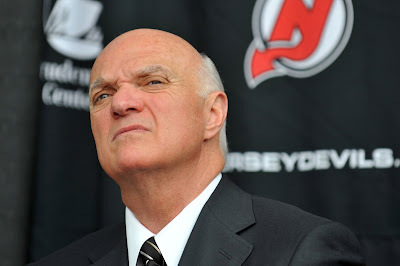 The next era of New Jersey Devils hockey officially began yesterday with a stunning announcement early Thursday morning that Devils President Lou Lamoriello had resigned his position and was headed to Toronto to become the new general manager of the Maple Leafs. I'm not going to bored you with details and minutia as far as statistics go,but if you are a Devils fans that remember this franchise before Lou Lamoriello took over the reigns,you remember just how bleak things were and how bad the Devils were. Before Lou-the franchise had made the playoffs just once and that was in Denver as the Colorado Rockies in a best of three cameo that saw two straight losses to Philadelphia. Anything that was worth noting in the New Jersey Devils history came under the stewardship of Lou Lamoriello. Bringing the first players from the Soviet Union,drafting the core of three Stanley Cup winners,maneuvering a silly compensation system to land the best defensive defenseman of his time ,managing to keep the greatest goalie of all time at a rate that was more than affordable and building a defensive system that was so effective at shutting teams down that the league twice changed the rules in order to add offense to the game are just the main cogs of the Lou Lamoriello era. Lamoriello also managed to build a tradition that put the logo above individuals,fight off a potential move to Nashville of all places and give the team a glittering arena that ranks with any in the country-all factors that built the dominant team in the Eastern Conference for years. New Jersey Devils hockey is always going to be a tough sell in a market that is over-served with three teams. Lou Lamoriello knew the issues that he would face and built the Devils from the bottom and succeeded well beyond what could have been expected. However,the "new " NHL game seemed to see Lou lose a little off his slap shot. Lamoriello continued to try to fight the new direction of speed with older and slower players,a decision that left the Devils frustrated and unable to keep pace with faster teams. Lou's free agent signings were designed to keep an aging team afloat in an attempt to remain competitive and instead kept them fluttering closer to the edge of mediocrity. Signings like a molasses slow Anton Volchenkov,a clearly physically damaged Ryane Clowe and a long term deal for Bryce Salvador in a overreaction to the last Devils run at a title are just a few things that contributed to a team's speedy decline. Combine that with the persistence in sticking with David Conte (Click here for our thoughts on the recent canning of Conte),who had real problems in drafting forwards over the last decade for the new style and it's easy to see that far all the good that Lamoriello had done for the franchise,it was Lamoriello that was mainly responsible for the team's fall from grace along with the hole that Ray Shero will have to dig out of.. Forget the "astonishment" of the owners and Shero that Lamoriello left for Toronto. Any observer that has watched the Devils during the Lamoriello tenure could have foreseen that Lou Lamoriello was never going to be happy without micromanaging every aspect of the team. This was just a matter of time,although I'm surprised that this happened this quickly. Lou Lamoriello was never going to be satisfied with just a advisory role in personnel and the Devils should have certainly known this beforehand. It was that single mindedness that built what New Jersey had done and it had a lot to do with the situation that the team currently faces. Raise a glass to the man that built the Devils into a franchise that changed the game and try to forget the end to his reign. Podcast:Melissa Pfeister chat,Lou Lamoriello leaves and more! Podcast: Sunoco Stamps,Harrisburg,Upcoming Plans and more! Today,we start our latest interview with Jessica Rosales,who is the reporter and host for Golden Boy Promotions and their boxing broadcasts,most recently on Fox Sports One. Jessica has also worked for the Los Angeles Dodgers on as an in-game host and has done assignments for various entertainment networks..
We welcome Jessica,thank her for her time in doing the TRS interview and are excited to announce that she has agreed to appear on the podcast sometime in the fall! TRS: Tell us a little bit about your background.Where did you grow up etc? Jessica Rosales: I grew up in the Antelope Valley (CA) and graduated from Palmdale High School. I then attended Cal State Northridge and have been living in the valley ever since! Love being here because I am very close to all of my family and we don't live too far from each other. TRS: Did you have an athletic background in school? JR: I grew up very active in gymnastics and cheerleading,but in high school,I stuck to the sideline. I was a flyer and tumbler on our squad and a captain my senior year. Friday night football games are still some of my favorite memories from high school. But a lot of my high school life was spent editing and reporting for our Visual Communications class. I started my career pretty early on!!! TRS:Where did you go to college and I assume your major was either journalism or radio/tv? JR: I attended Cal State Northridge (Go Matadors!) and majored in journalism with an emphasis in broadcasting. TRS: How did you find your way into working for the Dodgers as an in-game host? JR: I actually worked covering the Dodgers since 2008 (until 2013) for Time Warner Cable's "Dodgers on Demand"-an exclusive video on demand channel that was 100 % Dodgers. 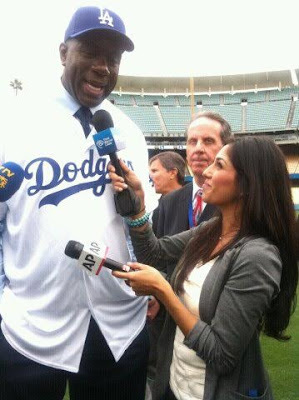 From that,I became good friends with a lot of people that were Dodger employees and in 2014,i was asked to audition for the in-stadium host role and didn't have to think twice about it. that I became great friends with while working for TWC all those years. It was such a great environment,lots of amazing friends and support and in a heartbeat I would do it again. JR: Pros-Everything! I really considered this my fun job,at the time I was working three place and I've enjoyed each and every position that I've held,but there was something very different for me being at Dodger Stadium and with Dodger fans and all my friends,I really felt in my element.Can't top that feeling. I apologize for the font and backgrounds differences,but there is a issue with my email size. Look for part two coming up soon!! R.L.Malpica gained two points on me and moved into a 90 -90 tie in the boxing challenge after a big boxing weekend. 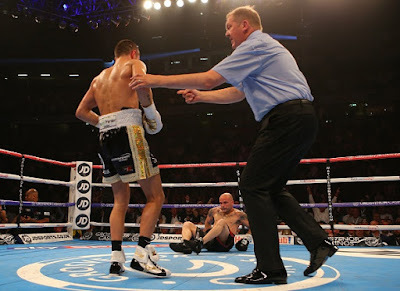 The most impressive winner of the weekend was England's Scott Quigg,who retained his minor title with a destructive second round knockout of former champion Kiko Martinez. Quigg vs Carl Frampton would be a huge fight in the UK,but Frampton's signing with PBC makes that unlikely. Quigg will face another former champion in Nonito Donaire next time out. The aforementioned Frampton was dropped twice in round one in a PBC bout against Alejandro Gonzalez Jr,but rose and dominated the fight after to win a unanimous decision. The future of the Showtime boxing program looks very bleak after a awful card from El Paso,Texas. In a fight that was enough to make one watch soccer,McJoe Arroyo won the IBF's vacant Jr,Bantamweight belt via unanimous decision in a bout stopped after 10 rounds due to a headbutt over Arthur Villanueva. I had Arroyo ahead 96-93,but what a dull fight. In fights that I did not see,Arthur Abraham gave R.L the points he needed with a seventh round KO of Robert Steglitz in their fourth bout to keep his minor 168 pound belt. The Boxing Challenge continues with some PBC on CBS and Showtime along with some key fights from Europe. CBS features the American debut of Carl 'The Jackal" Frampton as he defends his IBF Jr.Featherweight title against Alejandro Gonzalez Jr.,the son of the former featherweight champ. Frampton,who was unable to come to terms for huge money in the UK for a bout vs Scott Quigg,signed with PBC and likely took any bouts vs Quigg or Guillermo Rigondeaux off the table. The Haymon bunch hits Showtime later in the evening with overweight (again) Julio Cesar Chavez Jr taking on little known Marcos Reyes and McJoe Arroyo against Arthur Villanueva for the vacant IBF Jr.Bantamweight title. The Aforementioned Scott Quigg defends his minor title against Kiko Martinez in a bout that if Quigg wins could get him Nonito Donaire next. Martinez has lost to Frampton,so this would be a nice comparison against a common opponent. The card also has Darleys Perez vs Anthony Crolla in a lightweight minor title bout. In Macau China,the IBF's Jr;Lightweight title will be filled as IK Yang faces Cesar Cuenca for the title stripped from Lamont Peterson. Germany features the fourth and final bout for the WBO Super Middleweight title as Arthur Abraham defends vs Robert Steglitz. Abraham leads the series 2-1,with Steglitz holding the only stoppage win. I currently lead R.L.Malpica in the boxing challenge 84-82. The inbox is more than full,so it's overdue for dumping. 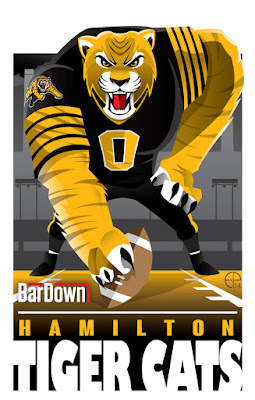 We blast out of the gate with a cool post from TSN (the ESPN of Canada) with BarDown and the cartoons that he does based on each of the CFL teams. 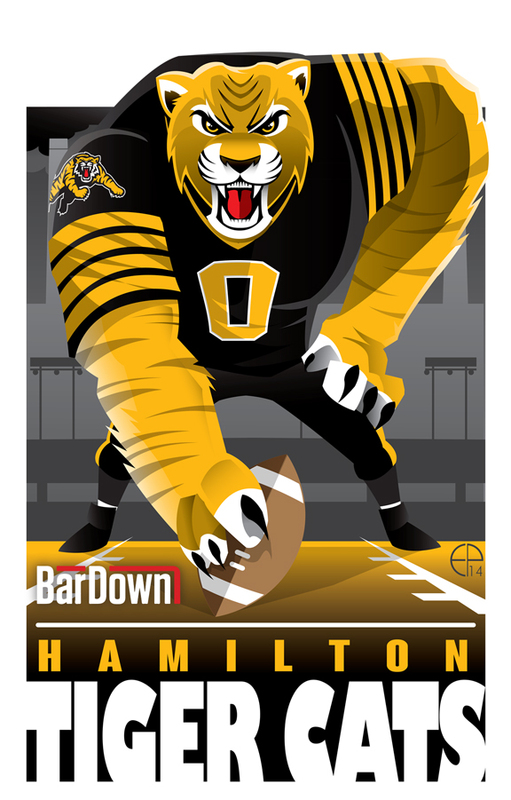 These are awesome and I wish that they'd get more exposure along with the CFL getting "BarDown" a few bucks to use these officially. SI.com writes about the forgotten dynasty of the USFL-the Philadelphia/Baltimore Stars,who won two of the leagues three titles and lost the first by just 24-22 to the Michigan Panthers. Considering the issues of the time in Baltimore,one unknown question in football history is this-had the USFL forced a better result in their court battle vs the NFL and if the Stars had pulled out that first title,would it be possible that the Stars could have entered the NFL in Baltimore? If that happens,there is not a Browns move to Baltimore and all the resulting spinoff that happened from that. Nigel Collins of ESPN (and a long time boxing scribe) scribbles about the only fight in the United States by Middleweight champion Carlos Monzon in 1975 vs Tony Licata. Most observers rank Monzon as one of the top five middleweights and one in particular ranks him at number one. Here's a hint-you read his writings all the time. Ryan Clingman of the Wrestling Observer writes of the 25th anniversary of one of the greatest wrestling matches ever,which led to the greatest run of business in Japanese history with Mitsuharu Misawa breaking through with an upset of Jumbo Tsuruta. 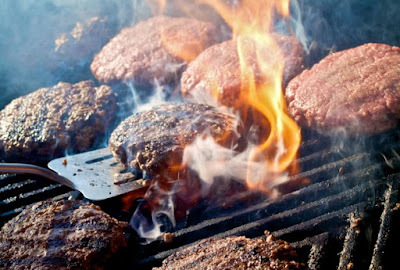 Hardball Times hits one back through the grill with a look at minor league food at various ballparks. It's funny,I almost never eat food at my home three parks,but when I go to new parks,I usually try a thing or two. The Cleveland Plain Dealer takes an interesting look at some of the various players that the Cavaliers could be interested in with the Brendan Haywood trade chip before August 1 when it would expire. The players and positions vary,but gives plenty of food for thought for possible new Cavaliers.. The New York Times writes about the trip to Pluto and the resulting end of planetary exploration. That cleans things out for a while. One quick note before I go,I haven't forgotten about the podcast. It is just that I have had a planned guest have to back out twice in the last few days. There is one coming soon-I promise!!! 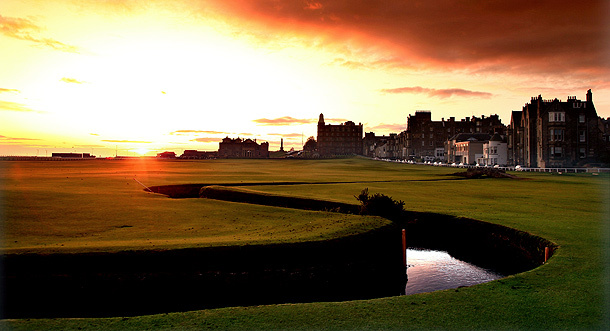 Yes,I love the British Open. There's times that I even think that it is my favorite of all the majors in golf,although in the end the Masters barely hangs onto the top spot. And this comes from a guy that says if we ever plant more trees (and we have some that I'd like to remove),they have to be Magnolia trees to represent the Masters! I like links golf and even though I wasn't really a fan of the style at Chambers Bay for the U.S.Open,I really enjoy the version in the U.K.. I have more than a few reasons for liking the British so much,so here are they are! I get to watch most of the tournament at work! The difference is starting time and it comes on the air at either 3 or 4 AM and I am able to watch the tournament from start to finish,which is something that I cannot say about any of the three American based majors. The greens and fairways aren't the perfectly trimmed with brilliant green coloring as in America. Rather,it is a clunky mix of dirty yellow,crispy brown and some off green tossed in for color. It's different and once a year-it's golf! The ball can't be counted on to do anything until they slow to crawling speed. No matter where the ball hits,there is no guarantee it's final destination. The humps and bumps make it far more random at the British than the other majors. Cold,damp and often rainy-the British features more sweaters and overcoats in July than lightweight golf shirts and the winds can often lift an odd player to the victory circle. Huge and deep,the bunkers in the British can determine a winner (or more often a loser) should a ball find its way into one. Because this is an European event,it's almost like watching major league baseball when a prospect comes up from AAA. And finally two honorable mentions. The fuzzy satellite look that European events always seem to have on television,although that gets better by the year. Both neat items that set the mood for the British Open. Hard to believe that I've made it this far,but here I am. Instead of going back over the last year or going over what I hope to do over the next year,let's thank the people most important to me. Of course,I have to start with my wonderful wife,Cherie. Everyone likes to say the best this and the best that on wives,but the difference between what people say and this is that I'm right. Everyone that meets my wife is struck by her calm and goodness and most of all being able to put up with me. That is more than anyone needs to endure! Thanks to my children Ryan and Rachel for both being terrific adults. I have friends from the non-graphing world,the graphing world and friends that I have made online that I have been fortunate to have. 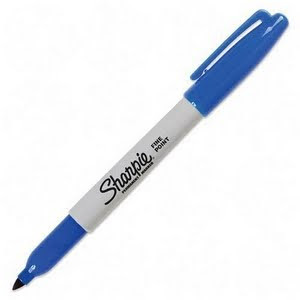 I'm not going to name all of you,but you are all appreciated. Some of you,I talk to almost everyday. Others a handful of times a month and others less than that/. I need to do a better job in staying in contact with some of you! The family outside of Virginia Avenue continues to be a work in progress,but improves,so I'm pretty thankful that at least things aren't crazy for now. I never thought I'd be where I'm at today. I'm always fighting something or dealing with something,but I'm sure almost everyone feels that way. Occasionally,you have to stop and say things are pretty good and "accentuate the positive",. Most days,I feel like that's selling out,but it's OK on occasion to say I have a pretty good life. Bob Lind sang a song in 1966 called "Elusive Butterfly and in the chorus was a line "out on the new horizon". That line came to mind as in two hours,New Horizons will buzz by Pluto and will leave us far richer in the experience along with knowledge that will have in living in a world that will never been the same again. 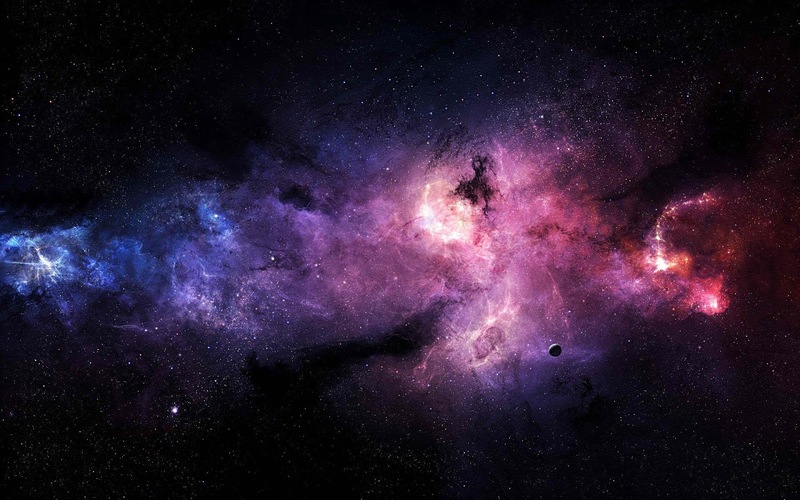 That may sound like hyperbole',but if you are into space science or general knowledge about the solar system,the world will never be the same. All the things that we thought we knew about Pluto will be turned upside down and the data that comes in the next few hours will be studied for years and years as unproved theory is replaced by reams of information that come from this flyby. It's funny the amount of information that this little flyby that will bring for a few fleeting days to the general public. Projects like New Horizons turn the public for a few moments onto science and then move onto a another topic,usually one that isn't quite so informative. It's the low attention span and constant amount of things to choose from in the news that keep important things from being funded. It would be nice that today's mission would mean more than just information about a planet that we have never seen in such detail before,but it likely won't be a big deal to more than a small group of people with interest in space science. I'm sure that I'll be writing plenty about New Horizons and what we find at Pluto,but this is more about Neptune. Yes,Neptune,which was the last stop of the outer solar system of Voyager two's tour of Jupiter,Saturn,Uranus and Neptune,which saw those planets visited for the first time (or second in the cases of Jupiter and Saturn) and saw dazzling pictures of detail never before seen-just like we will see from Pluto. Neptune's debutante ball was in 1989 and in a different television world than today. Yes,we were in the cable age and there were plenty of channels compared to 1979,but the numbers paled compared to 26 years later. There was no NASA channel to cover Voyager like you have today,but there was our standard for learning in good ol' PBS,which showed an basic broadcast of data coming in called "Neptune-up all night". Nothing elaborate,but covering something no one else was,which even today is often the case with PBS,grabbing a niche' that no one else is using and being satisfied with a group of people that want a little more from their television than just entertainment. The data would come in chunks and you would see the screen fill in pieces as they came in and were then sifted through the produce a picture through what Voyager had to offer,which was 1970's technology in its purest form (Voyager 2 took 12 years to reach Neptune) and needed refinement before you could really understand what you were seeing. The discovery of the "Great Dark Spot" and the richness of the methane coloring of Neptune (Uranus was far visually duller) led to a beautiful finished product,but the picture that you see above from Voyager was not what you were seeing on PBS,which was essentially black and white with a few specks of color around the edges of the screen. Most of the really interesting discoveries about Neptune would come much later when there was more time to determine what the data told them,but what I remember about that night was even less about the first trip to a new planet than that I shared it with my son. I stayed up late even then and even though I knew that Ryan wouldn't be able to process what he was watching,I propped him beside me on the couch and shared the experience with him. It was more for me than for him as he was likely to never remember it,but I remember it like so many people had their young children in front of the TV when Neil Armstrong stepped on the moon. It just was a young father sharing a night with his son and I remember just holding Ryan in my arms after he dozed off with his night finished, as the night rolled on. It wasn't about what I learned or about what Ryan learned,it was about developing bonds and making connections,not really about Neptune. Tomorrow night,New Horizons will fly by Pluto in our last visit to an unknown planet for quite a long time and I'll be watching from the road office on NASA Tv or maybe on the internet. I'm a different person than I was then,older,heavier and hopefully wiser. The little boy that I held in my arms is now a man that is seven years older than I was on that day that I am quite proud of,but it's more than just pride. It's about looking back at a time that I didn't have much,but I had a great wife and put lots of energy into hopefully making my son a good person. Somehow, I think I'll be reflecting more on Neptune and the memories of a night long ago than that night flying by Pluto with a smile on my face. The PBC debut on ESPN led a disappointing day of boxing that looked worse (so I'm told) when held up against an entertaining night of the UFC. The ESPN version of PBC might be my least favorite yet. Teddy Atlas,always an opinionated commentator,appears to have been muted by the Al Haymon bunch and there appears to be way too many voices fighting for position outside the ring as Bernando Osuna (a strong boxing voice),former WWE commentator Todd Gresham (still learning the game) and ill-informed host Marysol Castro all trying to grab mic time with not enough slices to fill all. I've attempted to be fair in looking at the PBC host position as this isn't a traditional boxing show,but boxing,much like horse racing,consistently puts broadcasters that aren't knowledgeable enough on the broadcast and therefore in a position to fail. Castro flubbed several names and seemed lost when doing anything other than promos for future PBC cards. Once some time has passed,I think the PBC will shake this spot up a bit as their hosts have ranged from surprisingly good (Spike's Dana Jacobson),professional,but borderline disinterested (NBC's Al Michaels),completely reading off the company press release (CBS's Brent Stover) and finally to Castro,who looked to be not only overmatched by the product knowledge but wobbly on the basics of the game as well. Onto the bouts,which saw two less than stimulating bouts each have a little drama,only to be snatched away in the end. 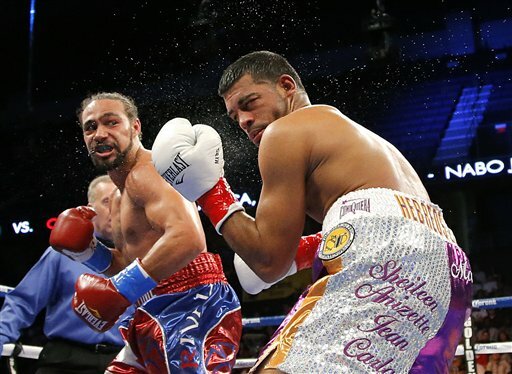 Keith Thurman controlled the first four rounds before being badly hurt by a body shot by light hitting Luis Collazo and being put into safety mode for the next two rounds. 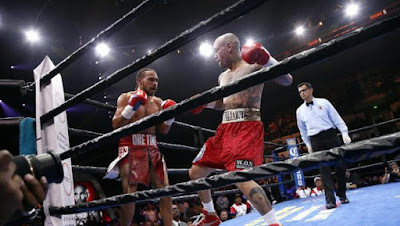 However,Collazo would quietly surrender in his corner from a cut following round seven for a less than satisfying ending for the fans and Thurman,who had failed to live up to his hype as the next great welterweight. I've always felt that Thurman's power was overrated and he must have doubts after spending two of his last three bouts in retreat mode against less than power punching opposition (Bungu and Collazo). Keith Thurman has been matched carefully (not uncommon in PBC) and has plenty to prove to me. The undercard showed why the PBC's mode of building fighters via showcases is a flawed one as hyped and undefeated junior middleweight Tony Harrison didn't know what to do when he stepped up against someone that fought back as Willie Nelson knocked Harrison out in round nine of a dull bout. I had Harrison slightly ahead entering round nine (77-75),but Nelson showed what you learn when challenged as you move your way up the ranks rather than being fed overmatched opposition. The knockout saved a less than entertaining contest..
Golden Boy had a pretty good fight going between Mauricio Herrera and Hank Lundy with lots of action on HBO Latino. The issue became moot as referee Jack Reiss stopped the bout in the fifth round with Herrera cut from an earlier headbutt by Lundy with the response of "The cut has a skin flap hanging over the cut". On television,the cut appeared to need work,but nowhere near as bad as Reiss thought. 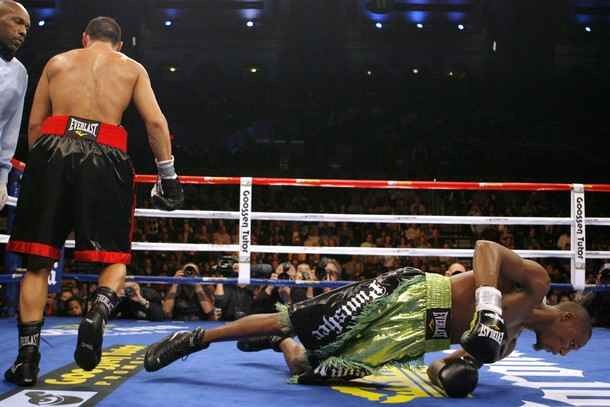 The unsatisfying ending went to the cards with Herrera winning a majority decision. I had it for Herrera by a point at 48-47 at the time of the reluctant stoppage..
Two WBO title bouts from around the world in the boxing challenge as Donnie Nietes took a unanimous decision over Francisco Rodriguez to keep his light flyweight title and Terry Flanagan earned the vacant lightweight title after Jose Zepeda dislocated an elbow in the second round and was unable to continue. In the Boxing challenge,I extended my lead to two points over R.L.Malpica at 84-82. The difference was my selection over Mauricio Herrera over Ramon's of Hank Lundy which gave me one point. The Boxing Challenge rolls on with five bouts this week! The PBC debuts on ESPN with Keith Thurman facing Luis Collazo. Ramon Malpica loves Thurman and raved about him in one of his recent blogs,but I've been impressed and have yet to be truly won over. Many think Thurman is the future of the 147 pound division,but I can't get his lousy effort vs Leonard Bungu and inability to get rid of Robert Guerrero,who followed up his fight against Thurman with a life and death split decision win over a clubfighter out of my mind. Luis Collazo was a champion years ago,but is coming off a lopsided loss to Amir Khan and will likely produce a less than entertaining fight. If Thurman can get Collazo out early,it would go a long way towards impressing me. HBO Latino has a matchup of two hard luck junior welterweights that provide good action and have both dropped their share of decisions that could have gone their way. Two untelevised bouts in the U.S. finish the week as the best bout of the weekend comes from the Phillipines as long time WBO Lt.Flyweight champ Donnie Nietes defends against former unified strawweight champ Francisco Rodriguez. Nietes has been an action fighter (if you look him on youtube) while Rodriguez produced one of the fights of the year when he unified his two belts. The WBO fills its vacant lightweight title in England as Ricky Hatton protege Terry Flanagan hosts Jose Zepeda in a battle of two undefeated fighters. 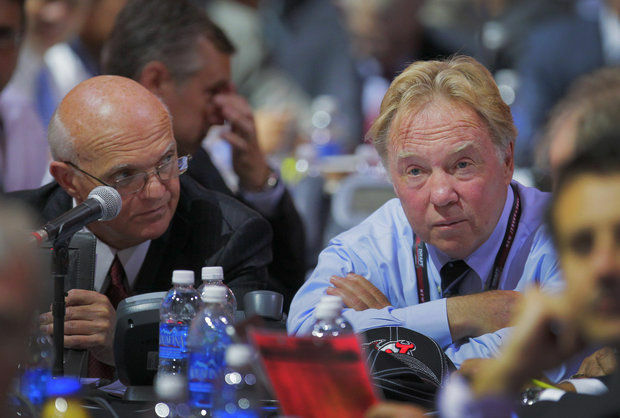 This is a few days old,but I finally had a few minutes to write a little about the man to my right (pictured with Lou Lamoriello) as David Conte was relieved of his duties as the Devils director of scouting. David Conte was usually a name that Devils fans discussed about the draft,saw him announce the first rounder and then retreat back into the fold for a year to repeat the cycle. Conte at one time was considered by Devils fan to be the eventual successor to Lou Lamoriello as the man that would run the franchise as he was an integral part of the Devils long time run at the top of the league. Conte was responsible for most of the Devils stars that were drafted in his 22 seasons with the Devils ranging from Brendan Shanahan and Scott Niedermayer early in his tenure to Martin Brodeur and later Zach Parise among others. The problem became that Conte became a victim of his own success as the Devils consistently drafted at the bottom of the first round and only Adam Larsson (4th in 2011) and Pavel Zacha last month were in the top ten. That saw Conte become more of a gambler and the Devils struggled in drafting forwards through the last ten years of his tenure. Other than finding Adam Henrique (3rd round in 2008) and the jury still being out on Jacob Josefson and Stefan Matteau,Conte became known more for out of the box picks (Adrian Foster) than for coming up for productive players,although he still had a knack for finding quality defense prospects in the middle or later rounds as the Devils drafted Jon Merrill,Damon Severson and Eric Gelinas all in the second round in different drafts. It had become clear to Devils fans over the last handful of years that David Conte had not made the adjustment to the new faster post-lockout style of play and his selections were based on the slower,more plodding era,which then resulted in what you saw on the ice-a team that were usually out-skated and speed deficient. Ray Shero has to have his people in place to implement his style and it has to start with the rebuilding of a farm system bereft in scoring talent. The TRS Podcast brought to you by CSA Cards! We make the case for Ken Stabler for Canton,DeAndre Jordan and how he set the Mavericks back years and the top football book on the market-Phil Steele's college football preview. Many times,a notable passing gets moved to a cleaning of the inbox,but tonight's passing of Ken "the Snake" Stabler from cancer at the age of 69 deserved a little more. Stabler,who had been considered for a forgotten superstars piece on more than a few occasions,was such a character that he was known by even casual or non-sports fans in his late 70's heyday. Stabler made his name at Alabama as the successor to Joe Namath before preparing for his NFL career in Oakland in the manner that quarterbacks were developed in the era-sitting for years behind a veteran passer in Stabler's case,it was Daryle Lamonica,who was the teacher to Stabler's student. Kenny Stabler on the field was often overshadowed by Kenny Stabler off the field with a hard living party image,but not one like Joe Namath's,Stabler was more of a man of the people. More comfortable in honky tonks than high scale parties,Stabler was the guy down the street that played hard and worked hard and as a result of all the powerhouse teams of the 70's (Oakland,Miami,Pittsburgh,Minnesota and Dallas) Stabler was the guy that was most loved by football fans that weren't Raiders haters (I.E.Denver,Kansas City and San Diego fans). Kenny Stabler was just plain cool and he might have won any poll that would have been taken for the NFL star that was the most fun to hang out with. Ken Stabler was respected in the football industry though as a player that you would have loved to have had the football in his hands when you needed one score at the end of a game. How many other players had three games that not only were game winners,but were endings memorable enough to earn nicknames? 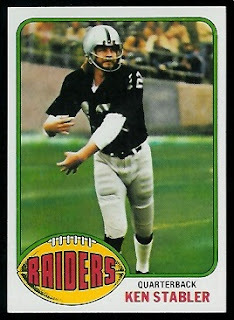 Stabler had those with the "Sea of Hands" with his threading the needle to Clarence Davis to down the two time defending champion Dolphins in the 1974 playoffs,the "Ghost to the Post" to tie the Colts in the 1977 playoffs in a game Oakland would win in double overtime and of course,the "Holy Roller" the deliberate fumble that pulled out a win over San Diego and saw the rule enacted that you see that affecting games to this day that you cannot advance a fumble with under two minutes to go in the game. Figure that in with the long scramble down the sideline for the only Raider score off the bench that allowed the "Immaculate Reception to be possible and you can see that Stabler was almost the Forrest Gump (also a Alabama grad) of 1970's AFC football! 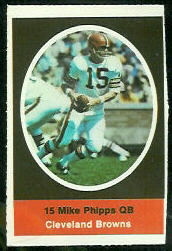 Stabler finished his career with Houston,with the rare star for star football trade for Dan Pastorini and New Orleans with the Saints first steps into becoming a contender,but was an immobile shell of the player he once was. Stabler was given the nickname of Snake for being able to avoid the rush and slide away from pass rushers and the Oiler/Saint version was the opposite-a player that was meat on the platter for rushers,most notably in a Monday Night Football loss for the Saints against Dallas,where he was hammered into several fumbles. The fact that Ken Stabler isn't in the Hall of Fame is a joke. I can rattle you off five names that I would say Stabler has a better case to be in Canton than that are already there. All and all,Ken Stabler,Hall of Fame or not,is one of the most memorable players of his time and will be remembered by football fans of all the memories that he provided. My Stabler McFarlane figure and autographed cards (each of the three teams he played for) will be a cherished part of my collection forever. First,we have the Kannapolis Intimidators with another less than inspiring White Sox farm team. The only two real prospects were second rounder Spencer Adams and catcher Brett Austin,who as a former N.C.State player added Go Wolfpack on request of mine. Former Dodger prospect James Baldwin Jr signed an old Donruss Elite,which I always am a sucker for getting signed and I got a Kannapolis team card of one of my favorite coaches,the personable Rob Sasser. The Lynchburg Hillcats went to Frederick and I got the two cards that I wanted most as Clint Frazier and Bradley Zimmer each signed their top 100's. Frazier is good for three or four and I finally caught up on him for now until new cards come out. Super nice guy and someone that I hope to see do well. Zimmer,however,is only one and as a result I have tons of things still for him and with more coming out soon,it's unlikely that I'll ever get all of them pounded out. Next into Hagerstown were the Hickory Crawdads and the Rangers affiliate was the worst team to hit the Hub City this year. Now keep in mind,the worst Low A team is generally pretty good for higher levels,so I'm not complaining,but they didn't live up to other teams thus far. The Crawdads do come back this season,so they'll have a second chance..
On the first night,the team was rained out and I did get Luis Ortiz on his top 100 after denying twice in the stadium,despite there being just three people asking and having nothing to do in the rain. It was a good thing that I got him because the next day was rained out and then the Ortiz experience continued with this on the morning DH/getaway day. Ortiz started game one,so as the starter,I wouldn't expect him to sign (or even ask usually) and he told the people that asked no. After the game,in which Ortiz lost,but was superb in defeat,"No". As the Crawdads came out for game two-Ignored. As he walked to the bus,"Not today",got on the bus "NO". Got off the bus "No",Finally he stopped on the way to the clubhouse and told the grandfather of a grapher he'd sign when he was done. Rock Shoulders,a former Cubs prospect, was less than great,usually doing 1 per,if he felt like it. He did sign two for me in the bus area as he liked the bowman blue wave refractor and added a heritage,but still left me with plenty for his return. Isiah Kiner-Falefa was one of the nicer players I met all year as he signed a heritage,two bowmans and a Spokane card and chatted for a good while. Travis Demeritte signed both cards that I had,but I was there as he was notified that he was going to serve a suspension from baseball,so he wasn't terrific and understandably so as he left the clubhouse. Jose Trevino signed his donruss elite,but my favorite addition was John Fasola,a pitcher from Ohio that saw my Browns hat and spent a few minutes talking Cleveland sports. The Myrtle Beach Pelicans arrived in Frederick for their first visit as a Chicago Cubs farm team. The Pelicans weren't as loaded as last year's Cubs Daytona team,but still had some interesting players. The first game was calling for rain when Bill Cover and I got there and former Braves prospect (acquired in a trade last year) Victor Caratini asked me if they were going to play tonight and I said I doubt it,I think you aren't going to get this in. Caratini signed his SAL all-star,SAL top prospect,Bowman and Rome Braves card and after a huge downpour that would result in the games postponement,Caratini ran by through the drops and said to me "You are a pretty good forecaster!". I suppose all those years watching Nicole Mitchell have begun to pay off! Duane Underwood signed his elite,Kane County and bowman as well as a baseball for Craig Lindgren.Jen-Ho Tsing signed a bowman chrome and Kane County while former Padres prospect Zach Cates added an elite and bowman from a few years past. Mariano Duncan signed his 1988 score and was very nice,but was reported to have said "I've signed my autographs for this series" the next night,so who knows? Tom O'Brien added some cards to my score set as he got White Sox coaches Bobby Thigpen,Daryl Boston and Mark Salas when the White Sox visited Baltimore during the now infamous "No Fan" game series. Always good to get score cards finished,thanks Tom! Thanks to Steve Nicholas for getting me three cards of former Indianapolis Indian Matt Hague when Hague returned there as a member of another team (I can't remember who). A trip to Harrisburg for the Trenton Thunder (Yankees) produced a few cards,lots of work and the Harrisburg arrival of Trea Turner,who finally was allowed to leave the Padres. The heat was strong,but lots of work did result in a few cards done. Thanks to Fred Landucci for getting the top 100's of Aaron Judge and Gary Sanchez among a few others! Fred is my main helper in Harrisburg and is always appreciated! Fred also got me the two Harrisburg players in the Eastern League prospect set in Austin Voth and Pedro Severino. Other decent Trenton catches were Greg Bird and Eric Jagelo,but the two big stories from this day was a Aaron Judge blast that left the stadium in left center field and Trea Turner's arrival. I was able to get Turner as he tried to sneak out of the park,but I scooped up the top 100 of Turner and finished the most important card on day one. The Richmond Flying Squirrels hit Harrisburg and despite not having a team set out yet,I still had plenty of cards for them. The lovely Cherie accompanied me in Giants attire and even helped me getting an extra Kyle Crick and Mac Williamson,who are one per. Crick signed his top 100 for Fred and former Rangers prospect Engel Beltre signed four cards for me,three of them from 2009! Mitch Delfino signed his old SAL All-Star card and the biggest catch of all-2014 first rounder Tyler Beede,who signed a top 100 and a USA card.. The Carolina Mudcats switched to the Atlanta Braves this season and were a bit low for a Braves team. The Mudcats were missing Lucas Sims (top 100) and Andrew Thurman (Lots of Astros stuff),who were both injured in a bus wreck involving the team that some of you may have heard about. The best pickups were Johan Camargo (Rome and Carolina),Yean Carlos Gil (Rome,Carolina and SAL All-Star) and former Padre Dustin Peterson,who signed two of the three I had (Carolina and Midwest prospect),but was nice in asking me "which two"? Carolina's stop was most noted for the antics of Connor Lien.who spent three days ignoring,saying no and running (literal running) by collectors. The funny thing was that Lien is from Annapolis,so one would expect a little more. The Royals CL team in the Wilmington Blue Rocks were pretty light in the prospects after a strong team last season. I wrote about my visit to Richmond,but I did finish a few things up that I didn't get finished in their Harrisburg visit. I managed to talk to Tyler Beede,who is quickly becoming a favorite of mine. Beede signed a elite (Numbered to 100) that didn't get to me in time for Harrisburg and got him on a baseball after chatting for a bit. WOW! Lots of stuff there,so that means now it's just down to putting these cards away as we begin to hit the homestretch of the graphing season where cards are constantly getting signed! 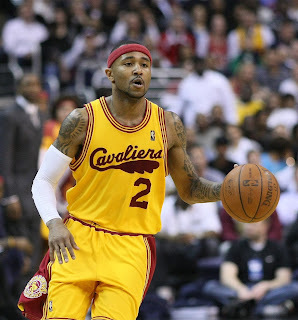 The man that led to the Cleveland Cavaliers landing Kyrie Irving will be returning to the team as Irving's backup as Mo Williams signed a two year contract (2nd year is a player option) to come back to Cleveland. Williams,who was traded to Los Angeles and the returning first round pick was the lottery winner resulting in Irving,fills what I have felt was the Cavaliers biggest need since LeBron James announced his return last season-a quality veteran point guard that can step in without a large drop in productivity in the event of a Kyrie Irving injury. When you see how often Irving gets injured,one can see that a Mo Williams is not a luxury item on a roster,but a necessity and considering his status as a fan favorite,was an excellent pickup. Williams averaged 16 points a game last season (Including one 50 point outburst) as he split the year with Minnesota and Charlotte and finished with just under eight assists a game,but he won't be counted to approach those numbers as a Cavalier. Rather,Mo will be counted on as the court general of the second team,keep Kyrie Irving 's minutes down and to give Irving a mentor that he hasn't had since entering the league. Williams turns 33 after the season starts and would be better suited for a smaller role that could not only prolong his career,but extend his effectiveness as well. The outside shooting of Williams dipped under 40 percent last season,but he brings enough with his shot to create an interesting backcourt with Irving in certain situations that teams could struggle to defend. Low cost,popular player,fits a need-What's not to like about Mo Williams and his return to Cleveland? We have a guest column today as our longest faithful reader,Big Don Cain visited the new ballpark in Morgantown WV for the West Virginia Black Bears of the New York/Penn league. Hello Shawn. 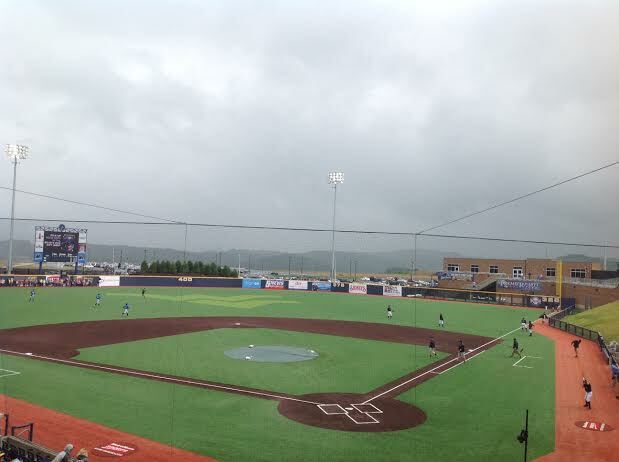 The following is my review of Monongalia County Ballpark. Location - The bad - MCB is behind and off to the right of a shopping area. If you don't know the area, you probably won't drive straight to the ballpark. The good - There are several restaurants located in the shopping area near the ballpark. Parking - Parking is $3. The good - It is just across the road from MCB. The bad - There is only one way out of the parking lot, and you are better off waiting until at least 15 to 20 minutes after the game is over. Tickets - Tickets are $11 and $12. If the seats are sold out, SRO tickets are sold for I think $9. The ticket prices are not bad considering that you are no more than 18 to 20 rows from the field when sitting in the top row. Merchandise - The Black Bears have an okay selection of merchandise. I have been to 55 ballparks and have seen much better and much worse selection of merchandise. Hats are $30 plus tax. Sizes vary greatly. I had to try FOUR hats on before I found one that fit. I have never experienced this before. Food Prices - Neither Mike nor I had any food at MCB because it is very overpriced, especially for a short-season A team. I have seen lower food prices in double-A ballparks. One example of this is $4.50 for a pretzel. The pretzels are big, but $4.50 is steep. I think sodas are $5.00. Graphing - There is little chance of graphing before the game. You have to do one of two things: Stand one side of the dugout, with little room to see the players and coaches, or stand at the other side which is far from the field, and hope that the player/coach comes over to you. Mike and I got one player (Cameron Varga) of Hudson Valley. That is only because I recognized him and he was nice. I think the players and coaches exit from a building beyond the outfield wall (and across from the parking lot.) Mike and I did not want to stay to just get a few cards signed. We were hungry from not buying anything food or drink at the game. Ushers - Overall, the ushers seemed relatively okay. There are also local police officers there in case anybody gets unruly. The ushers seemed as if they were there to help people, and weren't overbearing. The Field - The field is nice because it is new. Mike and I were thankful for the drainage system, because the game started on time, despite raining for a while before the game. I don't like artificial turf, though. When Mike and I entered MCB, our ticket stubs were torn off. I made a joke and said, "What is this 1985." "They tear ticket stubs off here, and they have artificial turf." Mike laughed. Game experience - The other fans were reasonably polite. There were a few idiots that got up while the game was going on. I have experienced much worse in other places. The music was not overbearing. The one usher near us told the music person to turn the music up. (The music is loud near home plate, and it's normal-sounding at other places in the ballpark.) Mike said "Don't turn it up." Then I said "If I want to hear loud music, I will go to some club." Then I made a reference to when they used to blast the music at The Diamond in Richmond when there was 800 people at a game. It was kids run the bases day. Mike decided to go back in the ballpark and go on the field. I followed him because I figured that we could take pictures. Mike found a foul ball on the first base side in the grass. Then it was time to take pictures. We took pictures of each of us standing on the Black Bears on deck circle, the Black Bears dugout, the visitors bullpen and the scoreboard. No one said for us to leave. It was a fun experience. The turf did not seem as hard as other artificial turf that I have stood on. Several people on the Black Bears staff said "Thank you for coming" and "Take care guys." There were about 20 vehicles left in the parking lot when Mike and I got there. I went to the end of the parking lot, and took a few scenic pictures. Then it was time for Mike and I to leave. 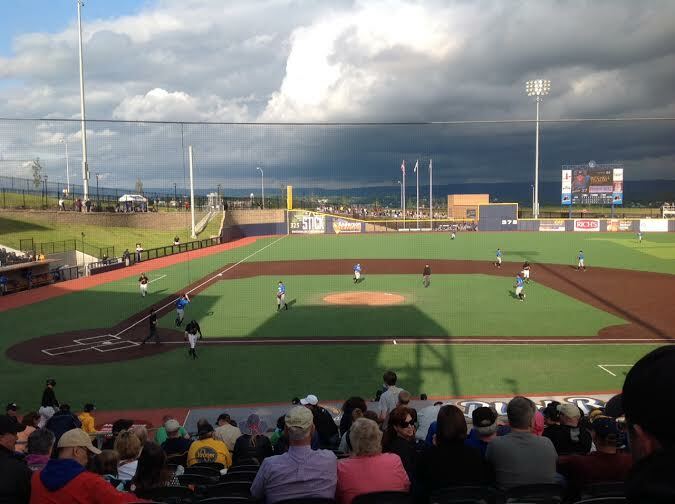 We both agreed that Monongalia County Ballpark was okay, and that we would go back at some point. 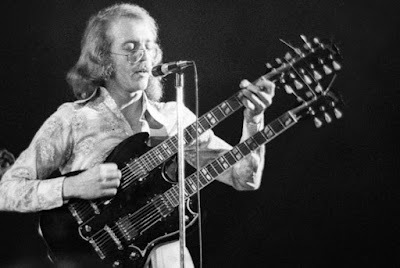 We discuss my selections for the ultimate sports cookout as well as my thoughts on the Glen Campbell film "I'll be me"..
We return to to the Forgotten Superstars universe with the addition of musical solo artist Bob Welch. Welch is best remembered for his two hit albums (French Kiss and Three Hearts) that saw four singles hit the charts. Ebony Eyes has been a hard driving mixtape (mix cd?) staple of mine for years,Precious Love is an interesting mix of the dying days of disco and the start of techno style and Sentimental Lady is a song that I'd wager has been on the wedding dj lists for years,but Welch was far more than that in his career. Bob Welch is often credited as the man that took Fleetwood Mac into the version that became a hall of fame level band as it was Welch that was part of that band putting together their first charting album in 1974 and it was his departure that brought the classic Mac lineup into the mainstream with the addition of Lindsay Buckingham and Stevie Nicks. Welch is noted for not being part of the Fleetwood Mac hall of fame induction,which is one of many reasons that I look at that hall as being a joke. Welch was not entered in with the group,despite being more influential than members of the group that were inducted with his work on the Heroes are hard to find album alone being more than enough to prove his chops as a valuable member of the band. Welch's career stumbled into the 80's surrounded by a cocaine addition that supplemented the slowing album sales and the resulting cleanup of his habit led to a transition from singer to songwriter. Welch would make some albums on small labels that would have him make new recordings of songs that he did over his career,many of them from the Fleetwood Mac era,but would never make an impact on the charts again,although they did receive some critical acclaim. Welch suffered from a spinal condition that saw him undergo a failed spinal surgery that doctors told him would not improve with time and would eventually be an invalid. Not wanting to have his wife to have to devote her time to taking care of him,Welch shot himself in 2012 taking his own life. Although I can understand Welch's decision,suicide takes away far more than it provides for the survivors and I wish that Welch would have taken a different path. 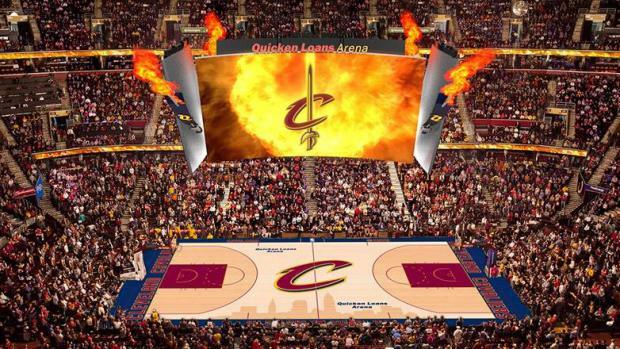 Dan Gilbert promised that the best was yet to come for the Cleveland Cavaliers and that money was not going to get in the way of that destination. Cleveland found themselves off to a fast start with the re-signing of Kevin Love and Iman Shumpert to long-term deals and it looked as if Tristan Thompson was going to added to the fold on the same day as well before an apparent monkey wrench has resulted in no current agreement,although talks are continuing. The big news is the signing of Kevin Love to a max contract for five years and 110 million and ending the last year of speculation (including mine) of whether Love was a long term Cavalier and was the loss of Andrew Wiggins worth the potential of a one year rental. Love's retention (and Shumpert as well) makes the Cavaliers a realistic title contender for the next few seasons and removes the speculation from the media that followed the team for the last year. That alone has to improve the team from a morale standpoint not having to answer the various questions spun off the same theme and could result in a more relaxed atmosphere. Love gives the Cavaliers the frontcourt scoring option that was so sorely missing against Golden State and allows Timofey Mozgov and Tristan Thompson (assuming he re-signs) room to roam in the paint. Iman Shumpert's four year contract for ten million per year (year four is at Shumpert's option) gives the Cavaliers a shutdown level defender that can defend both small forwards and shooting guards. Shumpert might be a player that fits better in a role on a winning team more than a key player on a lesser team and the salary paid Shumpert seems more reasonable than the contract that the Spurs gave Danny Green on the same day. Shumpert should plug in as a starter,but could also come off the bench,if the personnel dictates. Tristan Thompson looked close to a five year deal for eighty million dollars,but the reports are currently that the pair are still a little apart. Thompson did play well last season,but keep in mind that he is a one-tool player right now and is still rolling into his offensive game. I'm all for the Cavaliers retaining Thompson,but keep in mind that the more expensive that he is,the less money that Cleveland will have to spend on shooters and a badly needed veteran point guard. Mike Miller picked up his player option for next season as expected. The New Jersey Devils dipped a lukewarm toe into the free agent pool as they signed one player from the NHL level,one from an AHLer to bolster Albany and another one from the college ranks to add to the system as the player meat market officially opened on Wednesday. 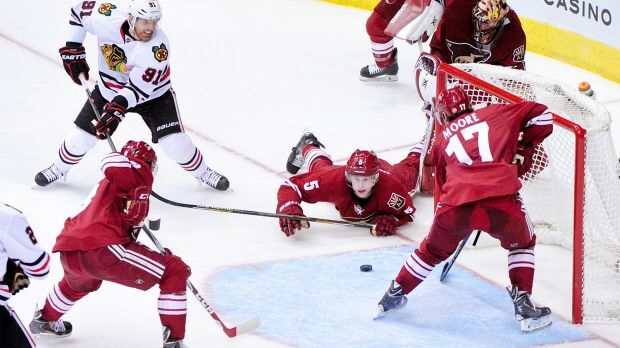 The biggest name was the addition of defenseman John Moore,late of Arizona,but also a former Ranger and Blue Jacket after being a first round selection by Columbus in 2009. Moore is just 24 despite being in the league for five years and brings a potential upside to New Jersey as a stay at home defenseman,but frankly has disappointed in three stops prior to Newark. Ray Shero has commented on the importance of internal competition and Moore should be in a battle for the sixth/seventh spot among the defensive group. Moore's contract is for 1.6 million a year over three years,which isn't really a terrible amount for a player that might see his fortunes turn with some development with some luck. The Devils also added Jim O'Brien as a depth player that most likely will spend the season with the Albany Devils in the AHL. O'Brien spent the last two seasons in the AHL with a stop in the KHL in between. New Jersey also signed someone that Devils fans hope could be a future contributor as the team signed former third round center Blake Coleman to a two year deal. Back later with a look at the Cavaliers on the NBA free agency start.